​Giroptic’s 360 Cam is now shipping to those who have preordered it, and also appears to be in stock on Giroptic’s website. Here are sample photos and videos. The included desktop software will allow you to customize the nadir. 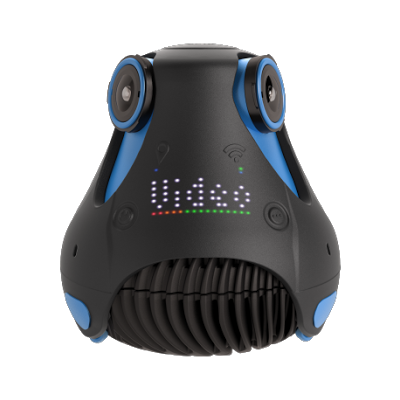 The 360 Cam is one of the few 360 cameras that are waterproof, and it has a larger field of view than hemispherical 360 action cameras such as the 360Fly 4k and Kodak SP360 4k. Its Lithium-ion battery is removable, and you can buy additional batteries ($39) for extended capture sessions. The 360 Cam also has livestreaming. To use the livestreaming feature, you need either a lightbulb adapter ($79) or an Ethernet adapter ($279). Once attached, the 360 Cam can live stream via Wi-Fi to a smartphone or desktop. The Giroptic 360 Cam is available for $499, which is the same price as the 360Fly 4k and Kodak SP360 4k.